2008 January « Japan, Hockey, Baseball, etc. Since my comment on the Japanese Sushi Police entry at East Windup Chronicle triggered this post about Korean Pizza, I thought I’d write something about Japanese pizzas. Yes, yes, there are already plenty of websites and blogs out there tracking the bizarreness of Japanese pizzas, but this can be an endlessly watched topic due to specialty pizzas that are created new for each season (like many other industry in Japan). Tuna, corn, and potatoes on mayonnaise based sauce is probably already familiar to many who have experienced Japan and Asia. But wait, there is more! Without further ado, here are some recent offerings. Pizza Hut’s new thing for the winter is the “ebi-mayo crust” which is a sausage roll like crust (that in itself is not unusual, I think) filled with shrimp and mayonnaise instead of sausage. The shrimp-mayonnaise combination is popular here, and is a staple in many pizza delivery chains, and also appears in many other dishes. 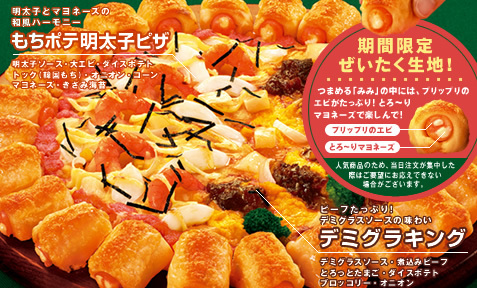 To top it off, the featured pizza here is the “mochi-pote-mentaiko pizza” which would be pounded sticky rice pieces (it’s actually tteok, the Korean wave continues), potatoes, and spicy fish roe all on the same pizza, along with the shrimp-mayo crust if you like. There’s a delivery chain called Strawberry Cones Pizza. If that’s not enough, they offer a kalbi pizza, that’s Korean style short ribs. Many chains offered kalbi pizzas last year, but I don’t see it as much this year. This is eerily verging on “oh look at how weird Japan is” post, so I’ll just conclude that fusion/localized food can be good, some combinations and modifications are better than others. After all American pizza is a bastardization of the Italian original, and so is ramen noodles when compared to Chinese noodle soup. I’ve never read an athlete interview like this. This is an intelligent ballplayer, if not stat obsessed (an otaku, heh) of the sabermetrics kind. He’s totally in tune with progressive statistics and the importance of OBPs, though granted this is becoming more widely accepted by the general American media and fans as it appears regularly during TV broadcasts now. But Bannister digs deeper and applies the underlying philosophies to his actual pitching, this is really interesting. Now we’re not just getting sabermetric analysists in the front offices, but also out on the playing field! MLBTR: What’s the most misunderstood aspect of succeeding in baseball by typical fans, sportswriters, and announcers? Bannister: There are two things that make baseball unique from other sports. One, baseball is a game of skill that is accentuated by the physical tools of the person performing those skills. Most people superficially judge a position player solely on size, strength, and speed, when his eyesight, balance, rhythm, hand-eye coordination, and mental makeup are much more influential factors in his future success. It is when a player embodies all of these qualities that we get our superstars and hall-of-famers. I would much rather face a hitter with “80” power and “80” speed but bad strike zone discipline than one with no power and a .400+ OBP. Over the course of time, the hitter with the .400+ OBP is going to hurt me much, much more, especially if he is surrounded by other good hitters. Secondly, whether you like it or not, baseball is a game of randomness. We play outdoors (mostly) in changing elements and field dimensions, and each pitch results in a series of events that can go in either teams favor. One thing that I have have come to accept is that just because I train hard physically, I practice perfectly, I prepare diligently, and execute a pitch exactly as I wanted, it can still result in a home run. In golf, if you analyze all the variables correctly (lie, distance, slope, wind, etc.) and execute your swing perfectly, it will result in a great shot. Not so for a pitcher or a hitter. A hitter can swing the bat perfectly and it will result in an out more than six times out of ten. Therefore, as a pitcher, I study and play to put the percentages in my favor more than anything because I know that I can’t control the outcome in a single game or series of games, but over the course of a season or a career I will be better than average. I’m not sure what to make of the sudden resurgence of the former Swallows star and now a new Giants cog Alex Ramirez’s career. He has been superficially consistent through his NPB career hitting around .300 with around 30 HRs and 100+ RBIs every year. From my comment made on an EWC post. The 2nd round of J Ice West competition was held at the Villa Sanuki Ice Arena in Miki-shi, Kida-gun, Kagawa-ken over 12 and 13 January. The ice hockey finals for the 80th Intercollegiate Ice Sports Games was held on 9 January at the Hakucho Arena in Tomakomai, Hokkaido, and Toyo University shut out Meiji University 4-0 behind Haga’s natural hat trick to repeat as champions.